A posh hotel on Newcastle's quayside is brimming with women in ball gowns and men in dinner jackets, an unlikely location for an interview with the Manic Street Preachers I'm sure you'll agree. The Manic Street Preachers have had a difficult few months, to put it bluntly. The press have been full of stories about guitarist Richey's hospitalisation, self-mutilation and alleged alcohol addiction. He missed their Reading performance and it was even rumoured that if he didn't return, the band would spilt. I didn't know how James would react to questions about Richey, so I decide ask him about the band's recent French tour, the first since Richey's return. "It went really well, going to France was probably the best thing after what's happened. There was no pressure and no hidden agenda. It was almost like we were starting again. "In Britain we are always judged on moral grounds and expected to back up statements, that wasn't going to happen in France". The band, unlike many, have known each other since they were born. This clearly helped in dealing with the last few months. James readily admits to this. "We have always been friends, and we were able to deal with the problem as friends, not band members. We tried to give Richey as many options as possible and steered it away from being about whether the band would continue or not." 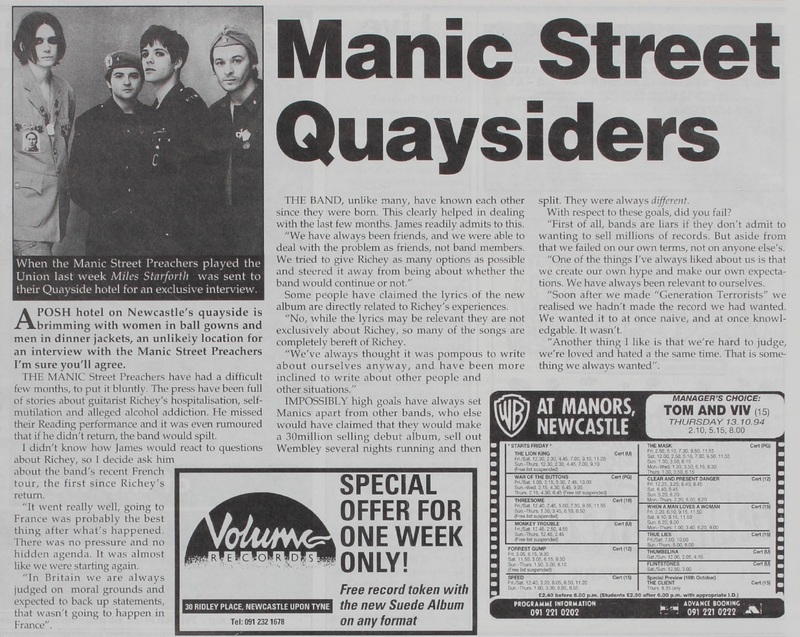 Some people have claimed the lyrics of the new album are directly related to Richey's experiences. "No, while the lyrics may be relevant they are not exclusively about Richey, so many of the songs are completely bereft of Richey. "We've always thought it was pompous to write about ourselves anyway, and have been more inclined to write about other people and other situations." Impossibly high goals have always set Manics apart from other bands, who else would have claimed that they would make a 30million selling debut album, sell out Wembley several nights running and then split. They were always different. With respect to these goals, did you fail? "First of all, bands are liars if they don't admit to wanting to sell millions of records. But aside from that we failed on our own terms, not on anyone else's. "One of the things I've always liked about us is that we create our own hype and make our own expectations. We have always been relevant to ourselves. "Soon after we made "Generation Terrorists" we realised we hadn't made the record we had wanted. We wanted it to at once naive, and at once knowledgable. It wasn't. "Another thing I like is that we're hard to judge, we're loved and hated a the same time. That is something we always wanted". This page was last modified on 15 May 2018, at 06:58.